Greetings, one and all! How does this lovely summer day find you? Well, I hope! It’s been SUCH an awesome week here, y’all. If you’re a regular reader, then you know that I’m having a nice visit with my best friend, who flew in from half way across the country (and across what we normally call That Stupid Gulf) to spend a week. A week of Nowhere to Go, Nowhere to Be. Of sandcastles and ocean breezes. Of the full moon over the lighthouse. Of eating too much and laughing more. But what were we up to this week, first of all? Glad you asked! On Monday, we featured this darling Minnie Mouse-Inspired Birthday cake. We think it would make an adorable wedding cake as well. Tuesday brought these fantastic cube-shaped Deconstructed Wedding Cakes. I love this look! I featured this ethereal Yellow and Blush Rosepetal Cake on Wednesday. Isn’t this Ice Blue Rustic Wedding Cake that we featured on Thursday fantastic? On Cake Topper Friday, we fell in love with this Picture Perfect Couple. For the Guys featured a mountain of chocolate, quite literally, with this Megeve Chocolate Groom’s Cake. Are you a curvy girl? Here’s a cute story featuring Five Marilyn Monroe-inspired wedding dresses. Ha! Thank you, Miss Manners. A gentle reminder that guests should not be asked to pay for your wedding. Do we believe Jessica Biel when she says she’s done “almost nothing” for her wedding to Justin Timberlake? Hmmmm? I adore this artsy backyard wedding, featured on Wedding Chicks, don’t you? 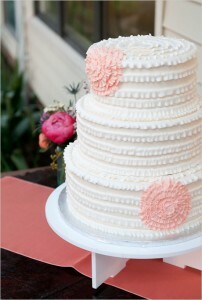 And the ruffled cake is so lovely, I feature it above. Isn’t this Maggie Austin Cake, featured on Austin Wedding Blog, gorgeous? I LOVE the green ruffles and blue flowers! Here’s a really great post for brides considering baking their own wedding cakes. From Vancity Bride. Have a Delicious Week! And wear your sunscreen!